Velas Resorts in Mexico bring the joy and wonder of the holiday season with gourmet gatherings, a Kids Stay Free promotion and other gifts this festive season. 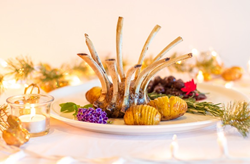 For those unable to make it to one of the resorts, with locations in Los Cabos, Puerto Vallarta, Riviera Maya and Riviera Nayarit, the resort collection shares its recipe for Rosemary Rack of Lamb with Cognac Cherry Jam. Velas Resorts in Mexico bring the joy and wonder of the holiday season with gourmet gatherings, a Kids Stay Free promotion and other gifts this festive season. For those unable to make it to one of the resorts, with locations in Los Cabos, Puerto Vallarta, Riviera Maya and Riviera Nayarit, the resort collection shares one of its holiday recipes. Heat the oil and garlic over low heat for 2 hours. Let cool. Rub the lamb with the oil and rosemary and let marinate for 24 hrs in the refrigerator. Bring lamb to room temp and preheat oven to 450. Roast in the oven at 450°F for 10 minutes, then lower the heat to 300°F. Cook for 10-20 minutes longer. While lamb is roasting, in a pan, add butter and onion and sauté over medium high heat until translucent. Add the cherries and continue to sauté until soft. Add the red wine and wait for it reduce by half. Add the cognac and flambé until the alcohol has burned off. Add the au jus and let it cook down for a few minutes. Pour the cherry sauce over the plated lamb. Christmas at Velas Resorts truly is festive. Travelers can bring their holiday celebrations to their stay at the Velas Resorts with a Christmas Tree insuite, pre-decorated or with ornaments to decorate as a family. Guests are also able to donate toys online to the Center for the Caring of Children with Cancer, a non-profit institution dedicated to serving children and teenagers with cancer. Holiday activities range from daily themed shows, picnic parties and Drive-in Movies to Mexican posada, Santa’s Workshop, Christmas cards and even a letter to Santa. Teens enjoy dedicated lounges, and for younger children, Kids’ Clubs offer a safe, fun and creative environment to engage in interactive activities. Offerings for adults include yoga and Pilates, craft beer tasting, salsa dancing, tequila and mezcal tastings, Spa Atelier workshops, and more. A special Christmas program and a New Year’s Eve gala dinner with themed menu and live entertainment will also be offered. For reservations, call 1-888-407-4869 or visit http://velasresorts.com/christmas/.